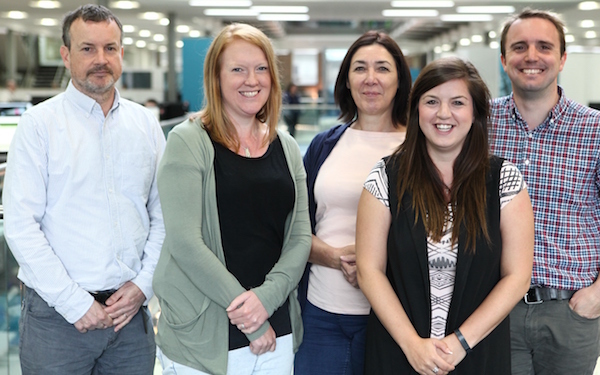 Chris Colcutt (end left) and Melissa McNaughton (second from right) with colleagues from York's referral and assessment service. For further information or an informal discussion around joining the team please contact Helen Healey on 01904 551 776 or Tony Holmes, principal social worker, on 01904 555 624. Why did you decide to work within the referral and assessment service? Chris: What really attracted me is that you don’t quite know what is going to be thrown at you. I can be dealing with enquiries from a member of the public about their relationship between their child and their partner, or a school ringing up to say a child’s presented with an injury. You do everything from section 17 assessments all the way to taking cases to court. It’s the whole spectrum. Melissa: What I love about the job is that you never know what you’re coming into. I like working with families from different walks of life as well as professionals with different backgrounds and expertise. There’s also the challenge of working with families. Often there are barriers and I like going through those challenges to help and support a family or a child in the best way possible. Chris: I also like the uncertainty. Knocking on the door and not quite knowing what you are going to come across. The uncertainty and the complexity are the main challenges but they are also the most interesting and rewarding aspects when you get to the bottom of what is going on. What other challenges do you face in this role? Melissa: Emotional resilience. You come across a lot of families and have to make a lot of decisions. You constantly have to think on your feet and be resilient. It’s not pleasant seeing children in distress or knowing that something is going on behind closed doors that you can’t evidence. You need resilience to deal with that and not take it home with you. What are working relationships with other agencies like? Melissa: There are good agencies that we work closely with here like IDAS, the independent domestic abuse service. The agencies you work with in York are never very far away so it’s quite easy to get information from around you and work together. When you get a case you’ve got to gather as much evidence as quickly as you can to make a decision and it makes the job a lot easier when you are not out there or waiting for a phone call back and those kinds of thing. We’re also co-located with police and health. What do you like about working and living in York? Melissa: I moved here for this job so it was a double whammy of living in a brand new place I didn’t know and starting a role I hadn’t done before. But York’s a small city and easy to learn your way around. You never have to travel far. I used to travel a lot in my previous job and so it’s a big bonus that you don’t ever have to go far for meetings or visits to children and families. Chris: York’s a very cycling friendly city and I cycle everywhere. I like cycling between visits – it gives me time to mull things over, get out and about, and keep fit. York’s tiny but there’s lots of going on. It’s very active culturally and for younger people there’s great nightlife too but it doesn’t oppress you. I lived in London for a long time and that’s a great city but it does become too much at some point. I like the size of York.